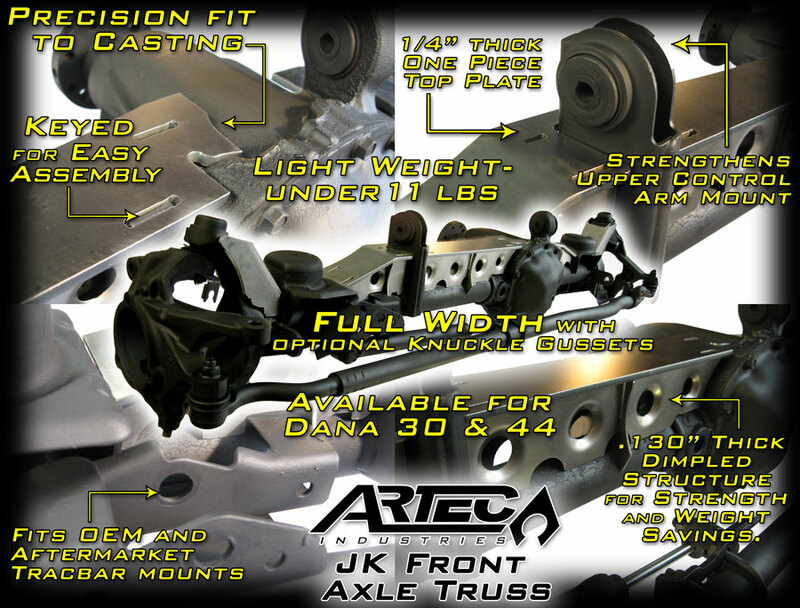 JKowners.com : Jeep Wrangler JK Forum > JK Community > JK General Discussion > has anyone seen the new artec jk front truss? 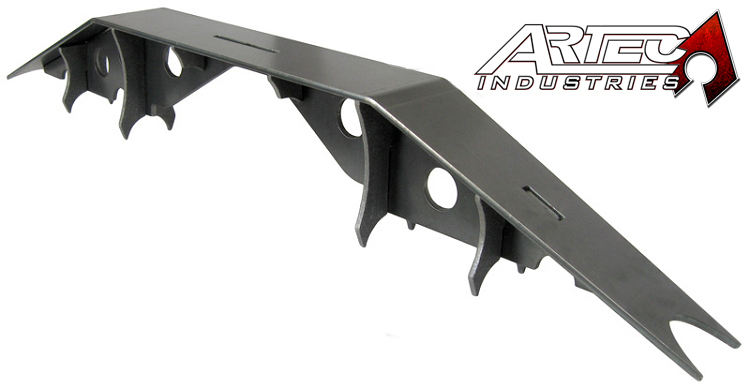 has anyone seen the new artec jk front truss? Looks super sweet. Goes the full span of the axle and even has speed holes (dimples) as an option. Anybody in the know have any idea when they're gonna start production? Well I have now. Looks fairly stout. For my money, the most notable part of this thread is all the fallout from bsack's fortune cookie factory explosion. yeah, those look very beefy. I'm really considering getting that one when it goes on sale. Damn, I like the short side support, thats one of my complaints with my PureJeep. Ok NEWB question time. 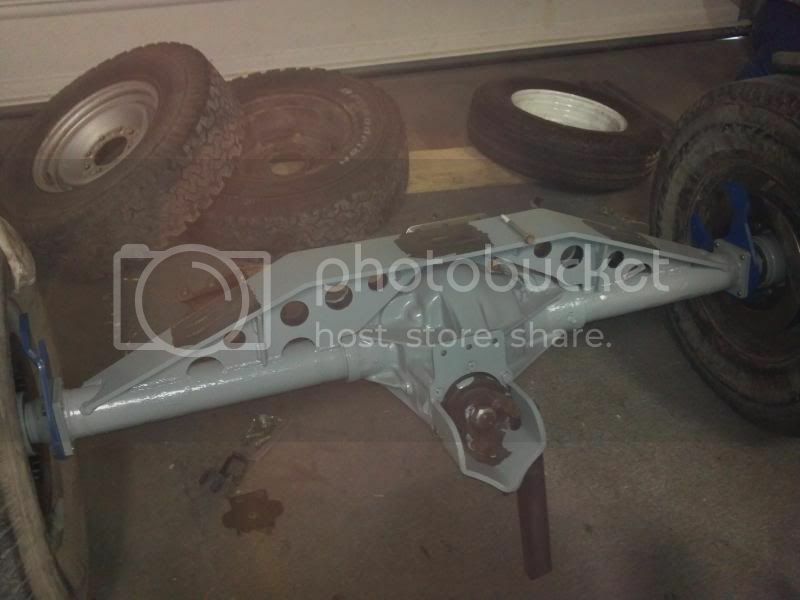 Is this something that can be welded to the axle while it is still under the Jeep or does it require removal? I'd also like to know a price for this. Looks great! Guess I'm the hater here, but don't like how it doesn't connect both side of the axle (over the diff). Mine does, and replaces all 4 control arm mounts with much sturdier ones. It's pretty, but I love the coverage of mine. Same here. I wonder id they would just sell the short side separately? Over all I think it looks like a great product IMO. Wow, that's one beefy looking part. Very cool. 08 2Door Red Rubicon. Rock Krawler 5.5 Longarm Coilover, Polly rear Coilovers. AEV hood & wheels, 37"KM2s, JE Reel 1350 shafts, 5.38 Yukon gears, Superior axles, Shrockworks stubby, Fab Fours rear, sPod, Rebel Offroad brakes, Warn winch and lots more. Seems to me that it would be a good idea to it some down force (come a long and a couple of blocks maybe) prior to welding this up, one to ensure straightness with the weight alone and two all of the welding draw. I'll look through my weld procedures and find the correct electrode and procedure to weld to cast for the punkin. Iirc it needs to be welded differently, we don't mess with cast very often so I don't want to throw out miss information. Very nice to be sure but looks like serious overkill to me for a stock housing. Lots of added weight too. 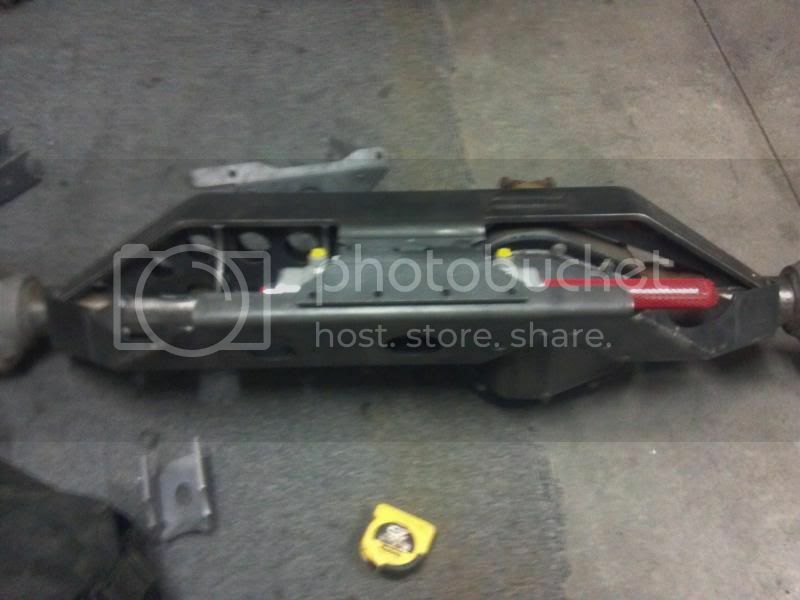 If you've gotten to a point where you need a truss like that you're either jumping or pre-running your Heep, or are probably way past the point where what you really need is a much bigger complete aftermarket axle. It will be popular though. Thanks for the input. We've been working on the pros and cons of this for quite a long time. Typically most of our trusses are one piece tops that span end to end. This setup is a different animal though. We considered many different things when making this: price, ease of installation, weight, effect on stock housing, shipping lead time, etc. This design was determined to offer the best of all worlds: lower price because of lower manufacturing costs, easier to install because nothing stock has to be removed and welding can be minimized thus the effect on the stock housing is minimal, and weight is much lighter. We analyzed it in solidworks with a piece that bridged the two sides together and there were no significant advantages in strength but significant disadvantages in weight addition and cost to manufacture and thus overall selling price. Because its a production item we can keep on the shelf and don't have to make different versions every time, it'll ship very quickly. The cast center section is by far the most structurally sound part of the axle so it was determined to weld to it as its been done successfully with many other trusses previously. The casting section needs very little extra done to weld to properly, really just preheat and post heat. I'll have exact figures and instructions ready by shipping time. I think you'll be surprised. The whole truss weighs only 10.65 lbs. For perspective, it only weighs a little more than a gallon of milk. Its top plate makes it look very beefy but its by far the lightest truss we've made. It gets its strength from its structure and dimples. 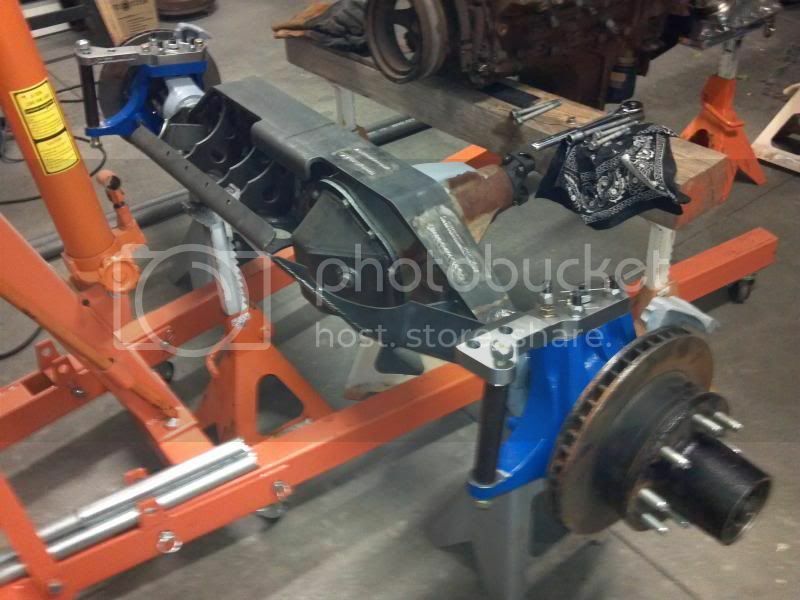 I know many guys that are in need of a truss that aren't ready for axle swaps. We feel this will make the stock axle a bonified option for keeping instead of forcing those who felt they had no other option than an axle swap. Thank you for at least mentioning that you guys use a stress analysis tool and at least somewhat engineer a product for it's intended use...versus just garage engineering something and sending it out. What loads were they tested at? Just out of curiosity. Any plans for a full length rear truss? I'm getting ready to pick up your rear 4-link kit and I would really like a truss that picks up more of the axle tubes then the standard jk44 truss. I stand corrected. Nicely done! I'll have to check. I don't remember off the top of my head. We plan to have a truss similar to this for the rear. But if you are getting our 4-link kit, you'll likely need something that isn't using the stock bracket locations. Here's what we offer that'll work for the rear if using coilovers. Here's a graphic highlighting some of the benefits, advantages, and features. They are definitely nice and sturdy. I saw one on a freshly built TJ on a trial run then bound for Utah on Saturday.